Hemp production is about to shift into overdrive in states where growers have been licensed to get started with the 2019 planting season. There is a dramatic increase in interest among new farmers looking to capitalize on hemp in states that have been growing the crop under pilot programs. Here’s an early look at 2019 hemp production as states release numbers of grower licenses and estimate dedicated acreage. Colorado projections have the state at roughly 50,000 acres of hemp by the end of 2019, The Colorado Sun reports. Oregon has 25% more growers licensed for the 2019 season over the 2018 total, with an expected 25,414 acres in production, according to the Portland Business Journal. Hemp as a crop in Oregon may be more lucrative than the state’s current No. 2 commodity, cattle and calves, which were worth nearly $820 million in 2017, according to The (Bend) Bulletin. Kentucky Agriculture Commissioner Ryan Quarles said there will be five times more hemp farmers (1,047) and triple the approved acreage (more than 50,000 acres) in his state than in 2018. Kentucky has approved more than 6 million square feet of greenhouse hemp cultivation. 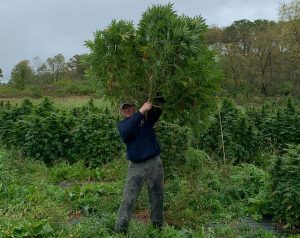 Tennessee’s Department of Agriculture is reporting more than 12 times the 226 growers who produced hemp in 2018, Nashville TV station WKRN-TV reported. Montana, the top-producing hemp state in 2018 with 22,000 acres planted, is taking new applications until May 1. Farmers there have until the end of May to decide how many acres they will plant, Montana Farmers Union lobbyist Chris Christiaens told Hemp Industry Daily. North Carolina, where the state has licensed 634 growers on 7,922 acres, as well as 3.5 million square feet of greenhouse space. Vermont, which has granted 427 registrations to produce roughly 2,711 acres of hemp. Alabama, where its first hemp season in 2019 has attracted 180 farmers and 70 processors, according to AL.com. As it becomes clear that U.S. hemp production will far surpass 2018, some are warning that a big drop in prices is the likely result. U.S. Secretary of Agriculture Sonny Perdue issued a warning this week that the nation’s farmers might be too enthusiastic about hemp. “Farmers in the United States are so productive, they could crash this market before it gets off the ground,” Perdue warned. Perdue’s comments came after two “listening sessions” in which hemp industry leaders told the U.S. Department of Agriculture (USDA) what they want to see in new nationwide hemp rules. But hemp farmers such as Kattia Jimenez in Mount Horeb, Wisconsin, are more excited than worried. Jimenez owns Mount Horeb Hemp Farm, a small operation outside Madison that grows hemp for CBD oil extraction. She said hemp is her “first foray into farming” and will plant 4 acres in 2019. “I grew hemp last year, and it was extremely hard work but very rewarding,” Jimenez said. Other Wisconsin farmers and allied businesses are just as hopeful about the prospects hemp offers, considering the tremendous interest in the state that spurred applications to increase by 600% year-over-year, she said. “In our state, the hope is this new agricultural crop can help our struggling dairy farmers,” Jimenez said. According to advocacy group Vote Hemp, total U.S. hemp acreage was 78,176 acres in 2018, up from 25,713 in 2017. How does one get started in the Hemp growing in Washington state?